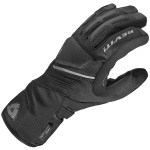 These gloves are very comfortable the internals are silky smooth. They also do the job of keeping my hands warm.... That is down to about 3degrees. With the recent cold weather my fingers have been getting very cold after an hour on the bike. Slightly disappointed as I bought them to get me through a British winter. They do seem to be waterproof although I've not ridden for a prelonged period in rain yet. The only other issue I have (which might be my wierd hands) is that while the gloves fit perfectly.... The thumb is too long which is an issue for the controls. I keep missing the indicator. The size down was to small in the fingers... Not sure why. Do I like these gloves..... They are OK. Would I buy again.... I would probably try something else for riding every day in the winter.